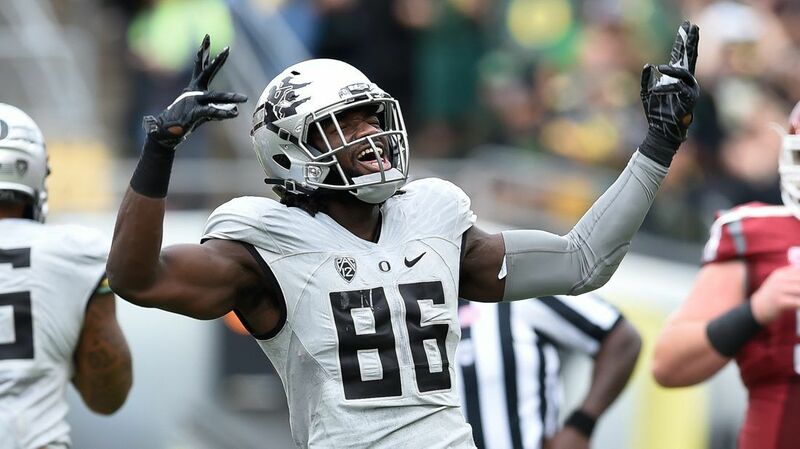 Update at 6:48 p.m.: Oregon linebacker Torrodney Prevot has been suspended indefinitely for a violation of the university and Department of Athletics codes of conduct, head coach Mark Helfrich said. His status as a student-athlete will be further evaluated. Oregon senior linebacker Torrodney Prevot, a key player for the Ducks defense, is under investigation for a criminal offense, according to the Eugene Police Department. A former University of Oregon athlete said she’s filed a police complaint against Prevot, claiming he physically assaulted her twice earlier this year. The Emerald requested the complaint from EPD. EPD declined to release a copy of the criminal complaint, saying the case is under criminal investigation. A clerk told two Emerald reporters that the matter has been referred to the EPD Violent Crimes Unit. Prevot was expected to play a major role in the upcoming season, but was not listed on the UO football team depth chart released Friday. Prevot played in all 13 games last season, starting in the final five. UO spokesman Tobin Klinger was not able to provide details, citing the federal Family Educational Rights and Privacy Act. He said all allegations involving “dating violence” are handled through the Title IX Office. Representatives of the UO Athletic Department could not comment on the matter. Prevot declined to comment.